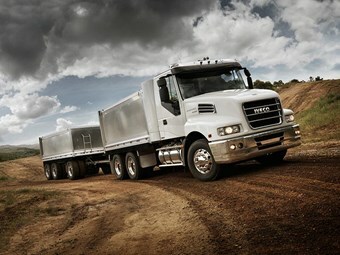 Iveco has announced a new lease option. Iveco Australia has a new offering for truck buyers after announcing its Active Plus Program, a monthly payment scheme covering a new truck lease and scheduled servicing. The manufacturer says the program, available across its medium- and heavy-duty range, can provide customers with a new vehicle every two-to-five years and servicing from Iveco technicians. "Iveco Active Plus keeps owners behind the wheel of the newest Iveco models, giving operators the benefit of enhanced budgetary control: vehicle expenses are known, the cost is fully tax deductible and the vehicle, being leased, does not impact on the balance sheet," the company says. The program does away with vehicle maintenance worries, Iveco marketing manager Darren Swenson says, allowing operators to focus on their core business. "A program such as Active Plus, essentially removes the work of managing and maintaining the equipment from the business owner, placing the responsibility with Iveco and freeing up resources for the business," Swenson says. "An additional positive is that there’s an option to regularly upgrade to the newest vehicle, which can bring many more benefits such as the truck always being under warranty and operators having access to the latest vehicle technology." Iveco says the program stems from a collaboration with its in-house financier CNH Industrial Capital, has leasing term options, four levels of truck maintenance coverage, and varied payment options.